This talk with Tommaso Capozzoli of Sartoria Vestrucci is a useful beginner’s guide for commissioning a suit. 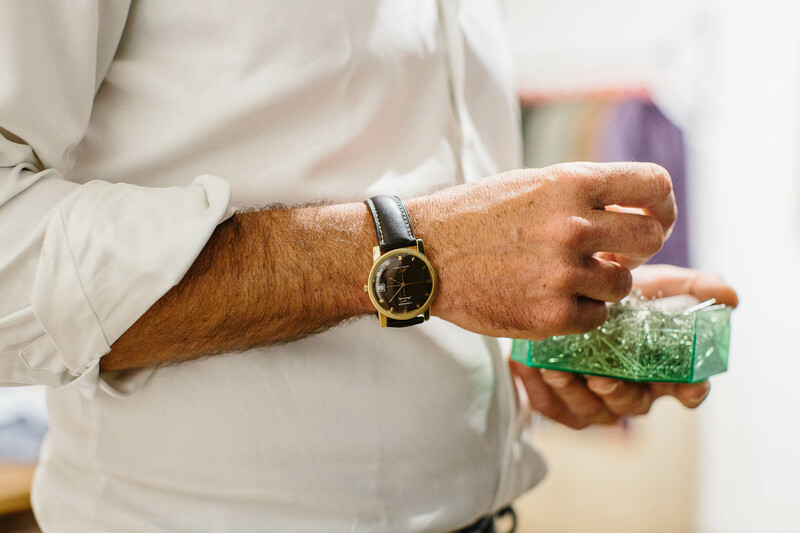 Tommaso explains how he would work out what kind of suit a customer wants, how he would direct cloth choices, and how the measuring process works. 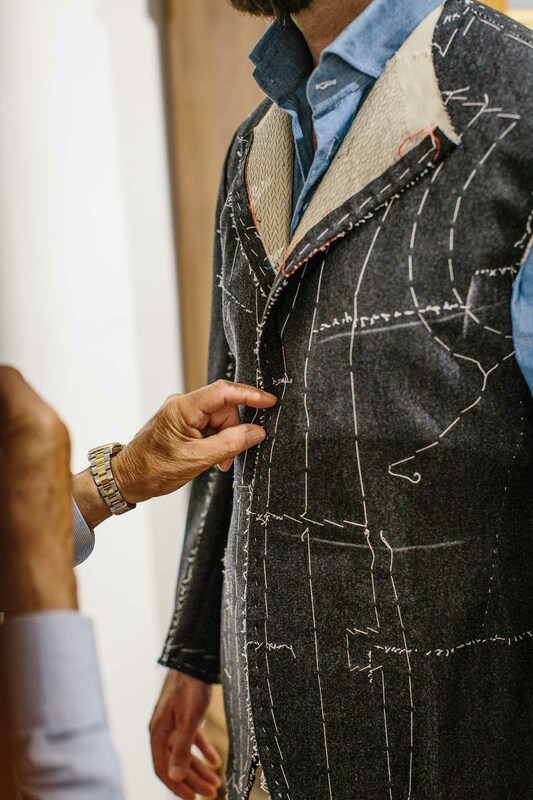 He also discusses the advantages of a bespoke tailor having a ready-to-wear offering, which the customer can try on to get a sense of the style. This is something I think a lot of bespoke tailors would benefit from, particularly for first-time customers, and particularly when they’re not familiar with the local style. Most people come in for a business suit, for a wedding, or as an experienced customer of bespoke. 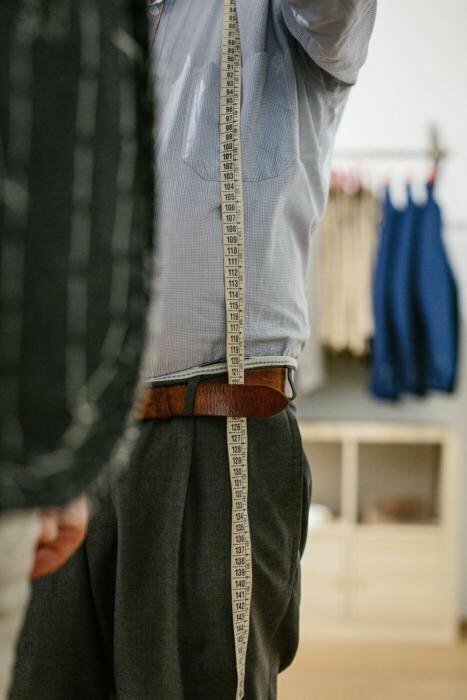 It’s worth telling the tailor early what your needs are. The second-most important thing to relate is where you live, and therefore the temperature the suit will be worn in. Or the time of year you intend to wear it. Young men often want something more fashionable – trying on a Vestrucci jacket is a good way to show how the house style is different. The Vestrucci style is defined by an extended shoulder, soft structure, and single dart in the front of the jacket (which means patterns are not interrupted). Trousers are usually made with a single pleat and a 4.5cm cuff, for a person of any height, as it provides a frame to the body. Customers are much more likely to want exactly the house style when they order their second suit. Customers should vocalise any thoughts they have when they see the fitting in the mirror. Vestrucci uses a lot of English cloth, because they personally like it and because of Florence’s connections to England. Try to relax while being measured, even if it doesn’t feel natural. The relationship you establish with the tailor is key, as it makes the process both more accurate and more enjoyable. All the quality of a good shoe or suit is hidden inside, so pick a tailor that can explain things well. Fittings can be done quickly at Vestrucci, even within 10 days, if enough notice is given. In the video I am wearing my charcoal-flannel suit from Sartoria Vestrucci, with a pink-stripe shirt from 100 Hands, a black knit tie and a green ikat handkerchief from Anderson & Sheppard. Tommaso is wearing a rather splendid suit, again from Vestrucci, in the cavalry twill I rewove with Fox Brothers. Learn more about how Permanent Style’s work and how it is funded, here. You can follow the discussion on Video: How to buy a bespoke suit by entering your email address in the box below. You will then receive an email every time a new comment is added. These will also contain a link to a page where you can stop the alerts, and remove all of your related data from the site. Thank you for the video! It was also quite nice to see how your and Tommaso’s jackets ‘behave’ when you move, thanks to the video. I have personally come to the conclusion that a quantitative approach might be helpful, i.e. try and figure out what sort of lapel width, length, trouser width you are comfortable with and convey that to the tailor, as I feel that these are the sort of things which can highly increase the enjoyment of a suit without necessarily encroaching on the house style. I also really like Tommaso’s suit (thought not something I would wear), which reminded me of a series you used to do about how other people dress… perhaps there is potential to revive that? Hey Nick. Yes, as long as you know you are still following the house style, there’s nothing wrong with knowing what lapel width you like, length, and trouser width at knee and cuff. The latter in particular, as this is rarely something a tailor has a strong view on. However, steer clear of specifying too much, like the waist measurement perhaps. That will depend on too many other things. I do try to keep that series up, but you’re right it’s been a while. I’ll plan another. Agreed, seeing the jackets on video gives you a whole other view on them. Might be worth adding a short video snippet on how the jacket moves in your tailor houses comparison series, Simon? Would love to see a revival of that series as well. Tom would be my first choice, even though you’ve written a bit about him before, but a more in depth view would be nice. I also think, given how much appreciation your posts on casual wear gets, getting someone from the Saman Amel team, or Agyesh might be a nice twist. Interesting video, Simon – I would have found this invaluable when commissioning my wedding suit two years ago. I imagine I’m firmly at the dilettante end of the spectrum in terms of bespoke, having only had one suit, a jacket and pair of trousers made for me, all by the same tailor. Giving some thought as to how I intended to wear the pieces (formality of occasion/time of year/larger ensemble etc) seemed to be pretty useful starting points. What I probably should have given more thought towards for my first commission is my general body type and how my choices would emphasise the things I wanted to accentuate and mitigate some of my perceived shortcomings. Having said that, with the exception of the length of the jacket, I don’t think I would change much else given the opportunity, other than making a few more trips to the gym. Great video. I wholeheartedly agree it’s great being able to try something on first. The fact this was not possible actually held me back from using one maker I was looking into for my own wedding. I ended up going with another maker where trial models were available, because I had never done a mtm-suit. In retrospect, having tried the first maker now, the result would have been a lot better, but I wanted something tangible for such big day. We live and learn. I was surprised to hear measurements would take only 10 minutes though, or was that a misunderstanding on my end? Also great to see some video of Tom, he’s one of the most stylish guys out there. What type of cloth is the pink stripe shirt you’re wearing? I think your shirt is a good example of why fusing just doesn’t work for button downs; it is too neat and conveys non of the natural softness a button down collar should have. I cant think of a single traditional maker of button downs who use fusing; unfused at least. and unlined at best. Thanks. I can certainly see that point with button downs. I like it still, though more in heavier cloths like oxfords where the crispness of the fusing is less evident. Yes I would agree an Oxford would certainly look better, but the beauty of the button down (and the essence too perhaps) is the roll of the collar points, which fusing, no matter how well made, means this cant happen. You’re right, that doesn’t happen. I’m not sure I’d agree it’s the beauty of a button down though – that’s a very cultural-specific American view. Few people outside the US wear them that way. It’s actually the way that Drakes (somewhat British in their approach) make theirs, presumably for an audience in UK/Europe………. I meant it to be clear that the Drakes button down in not fused, and that the collar points roll in the way that “American” cultural specific ones do. Interesting, do we know why? They have more confidence in the tailor I think, is the suggestion, and realise that the choices the tailor recommended with the first suit were the right ones. It it me, or is Tomasso’s own suit in serious need of “collar shortening?” When he’s sitting next to you at the table, there is a pronounced hump or roll at the back of his jacket collar. Whenever a suit is off the rack – I expect that hump to appear – and for my tailor to take care of the problem. But shouldn’t he be a better ambassador for his suits? Or is this the case of the artist looking a bit slovenly or roguish —- the way that some celebrity hairstylists have terrible hair but make others look amazing? He also discusses the house style – and how their jackets have a defined shoulder – but his own coat seems to have unlined shoulders (mostly) that are decidedly soft, no? Even when he’s standing up that collar shortening issue is surprisingly visible – but your own coat (while you’re sitting) shows little-to-no sign of this. You can never judge fit like that when sitting down. It depends hugely on posture and how you’re sitting. And a jacket that sat perfectly cleanly when sitting like that would look rather odd when you stood up. As to house style, it is defined in being fairly wide, not in being very padded. Both of ours have the same single-ply wadding in there. On the subject of fit, can l please comment on ties. Simon you’ve gone for that funny bend back of the front blade just below the knot, which looks a bit sloppy. Tomasso’s rear blade in hanging down a bout 4” below his waistcoat, which also looks a bit sloppy. Are these two the vanguard of a new dawn in how to wear a tie? @Wes Unless you’re Daniel Craig having jackets done in all kinds of crazy measurements in order to always look good regardless of sitting and standing, this will always be apparent to some degree. Simon, apart from posture, would it also be fair to assume the heaviness of the fabric in Tommaso’s suit compared to yours adds to this? I for one thought his suit looks marvelous and the jacket fit like a glove while standing. JB makes a lot of sense – and I thought the same thing about the Cav Twill. I guess my wrong assumption was that Tomasso knew he’d be interviewed sitting down (mostly), and that jacket (given his posture, the material, that he’s seated, etc.) does him no favors. I guess I was also wrong that the house style he spoke of was not really represented in the suit he showed up to work in that day. I get that a suit is meant for action – but most of us are sedentary at work (if we’re wearing a suit, or if we’re wearing something else). Most of us sit around all day. To that end – a suit should look good on you standing up or sitting down – and while it does the former it most certainly does not do the latter. I am no Daniel Craig but I look remarkably better fitted than Tomasso. But – points well taken. The bespoke reality is go for the ‘House Style’ and express yourself with the cloth and minor finishing details. Step outside of this and frankly you take a huge risk. A true bespoke tailor should be willing, and able, to make what the customer wants rather than just the house style. I often wonder whether a house style is true bespoke or hand made MTO. I’ve heard rumours of blocks being used for “bespoke” garments by some expensive Savile Row tailors. I strongly disagree Kenny. Over long experience I’ve found it is much better to make something close to the house style of a tailor. Asking them to cut a lapel in a different style is at leas dangerous and at worst disrespectful. They’re prime skill is in fitting, not designing from scratch. The comment is also a little naive – there simply aren’t any coatmakers in London that could make a Neapolitan jacket, even if the cutter could cut one. Technically an improvement on the Bemer video and informative as to the basics of a commissioning process. A point however: in both videos the interviewee has English as a second language and whilst well-spoken it sometimes appears that you are acting almost as interpretor. A contentious point, I know, but people are more relaxed and effusive in their own language. As such I wonder whether an interview with Richard Anderson, on the same subject, would have delivered a richer seam of insight. As an extension to this format it would be interesting to hear from the travelling tailors who visit the US to gain their insights (Hitchcock, A&S etc.) as I think their customer base might, generally, be more experienced and thus selective as to commissioning. Tommaso’s english was just fine. In dealing with nonnative english speakers it’s helpful to speak a bit more slowly and not use slang or colloquial expressions. Very true VSF. I would add, as a nonnative English speaker, the native counterpart should also “mitigate” his/her regional accent. For instance, I am used to north east, mid and west US accent, and, sometimes have a hard time understanding strong/thick southern US accents, Scottish, Irish, Australian end even English accent. My American wife also speaks Italian, but has trouble understanding strong/thick regional accents. Yes, the very thick U.S. southern accent can be difficult to understand, even for a lot of southerners. However, the thick Scottish accent is particularly difficult to understand. I am pleased to learn that sartoria Vestrucci’s trousers too are usually made with 4.5cm cuffs for a person of any height. I think that this is a more traditional style (also followed by a few long established Italian tailors) than the frequently publicized in the web by young experts 5-centimeter way (aprox. 2 inches). The latter, especially when paired with the more contemporary/prevailing 7.5-to-8.25-inch bottom width, has a weird (at least in my opinion ) “flower vase” look, no matter the height of the wearer. Points taken about the cloth for the shoulder/collar hump, but I disagree with the fundamental premise that the fit of a suit can’t or shouldn’t be judged by what it looks like when sitting. In business, that will be the position of the jacket for most of the time. I would not wear a jacket that fit that poorly while sitting. I’d feel ill at ease in an important meeting with my jacket looking like it does in the video. To further this, I have had one tailor I worked with make a point in the fitting process, to have me sit and see how the collar and shoulders sit (they literally don’t move, it is amazing) while I an sitting with arms on a table. Agree, can’t be perfect, but can be much, much better than what that is. I mentioned that language can be a contentious point. VSF and Fabrizio have slightly understood my target: Tommaso is easily understood the issue is the unconscious limits placed on expression when not fully certain in the language being expressed. Ideas and the fullness of detail can therefore be hindered. On visiting Copenhagen I was impressed by the Dane’s command of English (learnt as a second language from an early age), as such, due to the scholastic pathway, the language and delivery, though correct, was also very formal and may not have carried the ease of subtlety or humour more directly conveyed in their native tongue. I agree Anonymous. I missed that side of the coin. Nonnative speakers, depending on the degree of command of the second language (English is actually my third language – sorry for bragging 🙂 ) often miss the subtleties (and in Tommaso’s case a few words here and there too) conveyed by their native counterparts and, on the other side (your point), are unable to fully deliver the humor, subtleties, cultural content, etc. they easily would in their native language. Agreed. I will say that the individual who learns a second language at an early age can acquire that ease of subtlety or humor fairly quickly by living in that country for several months. So, studying abroad for a year or semester, Summer vacation etc are very helpful in this regard.